1. Preheat oven to 180°C/356°F. 2. Place your chicken breasts into a baking tray. Chop your chorizo into chunks and add to the tray. Tear your ciabatta into bite-size chunks and add to the meat. Slice your peppers into bite-size pieces and add them. 3. 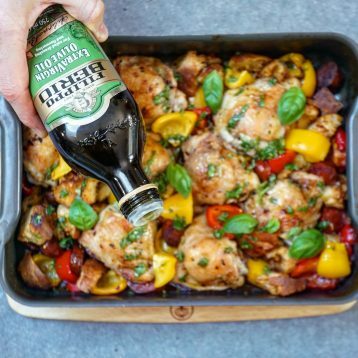 Add a teaspoon of chilli flakes (if you like it spicy) and then drizzle everything in Filippo Berio Extra Virgin Olive Oil. Season with salt and pepper, and put in the oven for 1 hour. 4. While the traybake is cooking, make your dressing. Just finely chop some basil and add it to a jar. Squeeze in the juice of half a lemon, and add 2 tablespoons of Filippo Berio 100% Italian Extra Virgin Olive Oil. Shake the jar and set aside for when you serve up! 5. After an hour, remove the tray. Drizzle your dressing over the top and serve!